This is a guest post by Charles Hackney as part of the ongoing conversation here at Political Jesus on Once Upon a Time and Grimm. Just for the record, Chuck agrees with me 100% that #OUAT is the better show (and no that is not just because he’s married to me). Amanda Mac’s post about Once Upon a Time and the theology of evil got me thinking. So I’ve put on my psychology cap (would that make me a mad hatter?) to take a look at the two primary villains of the series: Rumpelstiltskin and Queen Regina. Rumpelstiltskin serves as a Faustian devil in the show. A being of seemingly-unlimited power, people make deals with Rumpel, but the deals invariably end up disadvantaging the “customer.” In the second episode of the first season, “The Thing You Love Most,” Rumpel is revealed to be the one who provided the curse that Regina used to bring the characters into Storybrooke, but he requires her to sacrifice the only person she truly loves, and includes the provisos that he will be powerful in their new world, and that she will be bound to obey him (as long as he asks “please”). In the fourth episode, “The Price of Gold,” Rumpel kills Cinderella’s fairy godmother and makes a deal with Cinderella: her perfect evening at the ball in exchange for “something precious,” which turns out to be her firstborn. “All magic,” he says, “comes with a price.” In Storybrooke, Rumpel becomes the wealthy Mr. Gold, and continues to be the one who can make things happen… for a price. In the episode “Desperate Souls,” Rumpelstiltskin’s backstory is revealed, and that backstory sheds considerable light on his actions throughout the show. Rumpel was originally powerless. He was weak, crippled, cowardly, and impoverished. He had been conscripted to fight in the Ogre Wars, but ran away. Other characters treat him with contempt. His wife couldn’t stand to live with a coward, and so left him. A soldier mocks his weakness and humiliates him when he tries to bargain for his son’s freedom (“What do I want? You have no money, no influence, no land, no title, no power. The truth is, all you really have is fealty… kiss my boot.”). Later in the episode, Rumpel gains immense magical power by killing The Dark One (becoming the new Dark One in the process), and exacts revenge on the soldier. He becomes a figure of terror, later killing a man for accidentally scratching his son. Many of his further actions involve an insatiable drive to increase his power, and prevent its loss. He kills Cinderella’s fairy godmother in order to steal her wand. He manipulates the relationship between Snow White and Prince Charming in order to produce the ultimate in magic: true love in a bottle. When his son tells him that everyone is afraid of him, Rumpel insists that he needs “more power” to protect what is his, and when the Blue Fairy shows him a way to abandon his power and keep his son’s love, he is so afraid of losing it that he lets his son be dragged into an alternate world, apparently losing him forever. When Belle falls in love with him, and her kiss begins to make him human again, he believes it to be a plot by the queen to “make me weak,” and flies into a rage. In the final episode of the first season, Rumpel manages to open a magic portal, and it appears that he is trying to retrieve his son, but instead he releases magic into Storybrooke. Rumpel’s long-term strategy remains unclear, but it is certain that somehow it will involve bringing him even more power. When discussing the psychology of power and weakness, nobody does it better than Alfred Adler. Adlerian psychology (also called Individual Psychology) holds that the underlying force that motivates our behavior is a striving to compensate for helplessness and inferiority. We are all born weak and powerless, surrounded by giants and subject to their whims. Over time, if we handle these childhood feelings of inferiority in a healthy manner, our personality develops so that we strive for superiority in a way that benefits everyone (for example, if I strive to be an outstanding psychology professor, not only do I gain a sense of “mastery,” thus overcoming inferiority feelings, but my students also benefit from superior teaching, the college benefits from superior service, the field of psychology benefits from superior research, and so on). If these feelings of inferiority are not handled well, however, our personality becomes pathological. We do not have any indicators of Rumpelstiltskin’s childhood. All we have to go on is our one look at his adult life. However, many of his actions fit Adler’s description of an inferiority complex. The core of the inferiority complex is an unshakeable sense of “smallness,” manifesting itself in behavior patterns such as timidity, indecision, shyness, cowardliness, and submissive obedience. An unresolved inferiority complex can produce a neurotic personality, obsessed with safeguarding self-esteem and personal security. In Adler’s words, “All neurotic symptoms are safeguards of persons who do not feel adequately equipped or prepared for the problems of life” (“The Structure of Neurosis,” 1932). There are a number of pathological personalities that can be produced, but the one that best fits Rumpel is a destructive “Ruling-Dominant Type” (“The Fundamental Views of Individual Psychology,” 1935), characterized by an active and aggressive attempt to master their lives and the people in them. This type of personality undermines our ability to form what Adler called “social interest,” the sense of connection to and sympathy for one’s fellow humans. Rumpelstiltskin’s life of powerlessness left him with deep-seated anxiety, and he is so afraid of returning to a position of weakness that he would rather lose everything than accept anything less than utter supremacy. How will this pathology play out in the second season? 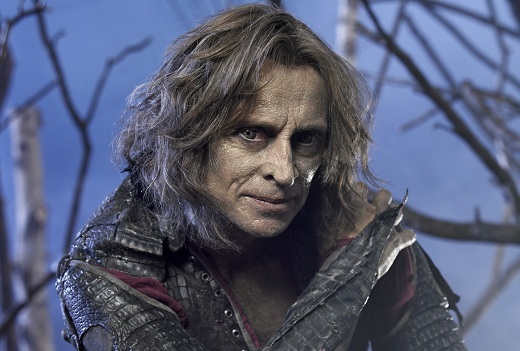 Now that magic has been introduced to the “real world” of Storybrooke, how will Rumpelstiltskin use it? How does this play into his ongoing contest with Regina? What is his real goal, and why was he willing to accept temporary disempowerment to achieve it? Will Belle stay with him, knowing that she could never be as important to him as his own power? This entry was posted in Political Jesus and tagged Amanda Mac, fairytales, Fairytales on TV, movies, music, & television, Political Jesus, psychology, television on June 15, 2012 by Amanda Mac. I am wondering if Mr.Gold’s/Rumpy’s experience as a special needs person plays into theologies that are attentive to the disabled. I would say such theologies, be they liberationist or otherwise would benefit from Adler’s theories. From a theological perspective, I’m never sure what to do with Adler’s theory. It seems that a Christian should hold that a healthy attitude toward life is to renounce the will to power and strive for self-emptying sacrificial love, not for superiority. Adler holds that all our motivation comes from the will to power, and that a healthy attitude is to channel our selfishness in a direction that does not sacrifice others to our desire for superiority. It looks to me like Adler’s theory does a pretty good job of describing humanity as it currently is (the fact that we do strive for superiority seems… this is my new word for this week… irrefragable), and that apart from Jesus we might not be able to do better than to play well with others while satisfying our selfishness. I just can’t see myself holding it up as an ideal of a highly-functioning person. So for you, wholeness is not possible? Depends on whether you distinguish between “wholeness” and “highly-functioning.” How high does one have to function to be “highly-functioning?” I recently went through Ellen Charry’s “God and the Art of Happiness” (Turns out Charry is also going to be a speaker at a conference that I will be speaking at in Virginia this fall. Awesome. ), in which she deals with Christian thought on happiness (defined in the Greek sense, as high functionality rather than positive emotion). I agree with her on this part: On this side of the eschaton, we will always remain broken to some degree. We can get better than we were, and achieve a certain good level of health and virtue, but perfect wholeness will always elude us. We will always be conflicted to some degree (I guess this makes me a bad Nazarene, since they teach that it is possible for the Holy Spirit to purge sin from the believer in this life). This an area where I part with most of my fellow positive psychologists (In fact, that’s what I’m speaking about at the conference). I believe that the fallenness of humanity, and the fact that we will never be pure until the resurrection, means that becoming a highly-functioning person will require us to combat evil within ourselves just as much as it requires us to cultivate goodness. although, I am gonna have to respectfully disagree. I think that Adler’s approach to selfishness does have its truth, but I don’t think one can easily fit capitalism into “Christian sanctification.” In fact, being the big pusher of Theosis I am, I think it is possible to strive for perfection, now, as in perfect love. Selfishness is something not just to be micromanaged, but something ENTIRELY opposed to the kingdom of God. In my view, Jesus’ self-emptying as well as God’s self-humiliation in creation and re-stricting Himself in granting us free will, are the ways in which the bible invites us to be liberated from selfishness. * The tactics conceal obvious aggressive intent. When the covert-aggressive is using the tactics, the other person has little objective reason to suspect that he is simply attempting to gain advantage over them. * The tactics covert-aggressive personalities use effectively play on the sensitivity, conscientiousness, and other vulnerabilities of most persons — especially neurotic individuals — and therefore effectively quash any resistance another person might have to giving-in to the demands of the aggressor. This personality also includes much charm and positive social interaction with the victim…and although I can imagine this for the rather jovial dark one, his counterpart or alterego Mr.Gold is a different story, both play off like the godfather, but one holds the charisma that’s usually cherished by the conman or sociopath. Here’s a list of ways they can, tell me this doesn’t sound like Rumplestiltskin? Although a few of these describe Regina, I believe she is more of an overt manipulator with some covert personality traits. I believe this is why Mr.Gold and Regina work well together. Mr.Gold’s manipulation strategies usually allow others to be propped up with slick words and seemingly decent trades (seduction of a common goal) which allows Mr.Gold to end up smelling like roses while Regina takes the fall.